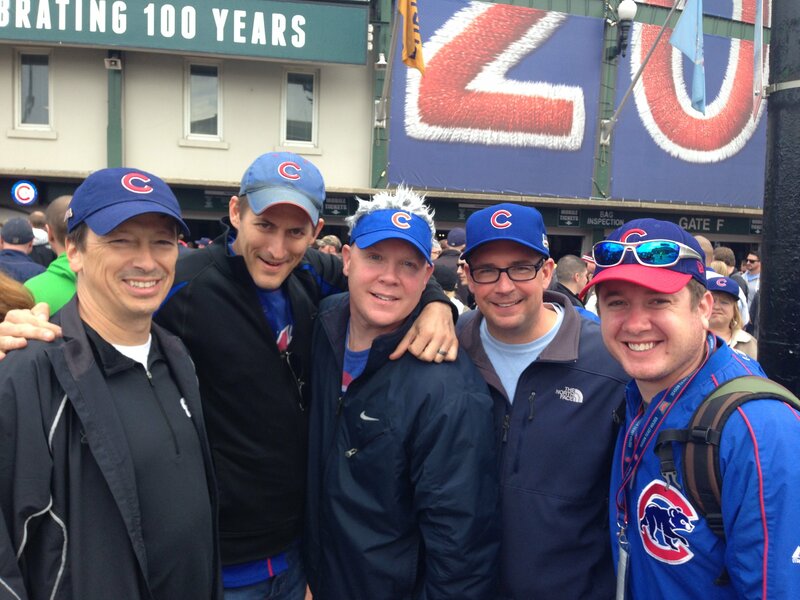 Last Saturday I had the chance to go to Wrigley Field for the first time and watch a Cubs game with three friends. It was an afternoon game and they decided I needed the full experience so we were going to make a day of it including taking the train and the Red Line subway. We arrived early and they took me all around the neighborhood to soak up the atmosphere. I bought a Cubs hat and we made sure we took group photos by signs indicating it was the 100th anniversary of the ballpark. We arrived to our seats about ten minutes before game time and were pretty animated about the game and the prospects of the home team against the first place Brewers. The day was not a cold as predicted and I was settling in for what I anticipated would be an awesome experience. All around us people seemed to be soaking up the experience in a similar fashion and there was a positive vibe around the stadium – in all places except the two seats in front of us. An older man and woman were there and were not talking to each other, let alone anyone else. Finally, just prior to the opening pitch, the woman turned around and uttered the words that appear as the title of this post. I was a little surprised and asked her if it was possible to do both. I received no reply from either of them. Various thoughts raced through my head as their words and actions seemed incongruent with the majority of the fans around us – fans that appeared interested in the game AND in having fun. We can have a significant impact on student motivation if we accept responsibility for engaging students. We need to get away from measuring success simply by what we do as educators and more towards what they receive as students and learners. I knew my challenge at the ballpark was similar. There had to be a way to engage the folks in front of us and build a positive connection. I watched both the game and the two people for the first couple of innings and noticed that they seemed to know a lot of the people working at the ballpark as well as some of the other fans in our section. I knew he would have a lot of stories to tell and at an appropriate moment, I tapped him on the shoulder and asked him to share his favorite Wrigley moment. He gave me a look that I initially interpreted as annoyance but was merely him running through his memory bank. He told me he was likely one of the few people there who had been to the park the last time the Cubs were in the World Series. “Granted”, he said, “I was only 18 months old and in a stroller, but I was here!” He had lots to share over the next while and I enjoyed his anecdotes. His favorite player was not one of the big starts that have dotted the rosters over the years but a player who hung around and signed autographs. He recalled when they were just regular people who had other jobs when they weren’t on the field. His friend now also began sharing stories about her trips to the park. They weren’t married but she gave her night game tickets to his wife because she didn’t feel safe coming to the games alone at night anymore. My friends were also participating in the conversation and equally captured by the identification of favorite moments and players. The game seemed to fly by and we were all celebrating the Cubs win (a rarity this season) and the other three went down to field level to connect with some other acquaintances. I hung around for a few second longer and thanked my 70-year old historian for sharing his memories. He said it was great for him as well because his short-term memory was gone (“I can’t remember the first inning by the end of the game”) and it was nice to recall some highlights. The connections for me in these two situations are that we can’t opt out based on the initial response. At the park we could have been grumpy right back at the two folks in front of us and everything would have spiraled down from there. I certainly would not have had nearly the same awesome experience. In the classroom, we can’t take our students’ lack of engagement as their final position either. We’ve got to find the ways to connect them and leverage that into a positive learning experience. In both cases, we need to act not react.